The Bible tells us that Lot was vexed with the filthy conversation of the wicked. As believers we must be in the world but we must not behave like the world. Our language, our conduct, our moral values, everything about us should be light in a dark world. 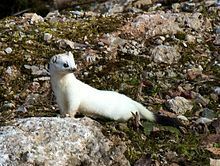 We should guard our testimony like the little ermine guards its coat. This entry was posted in Uncategorized and tagged ermine, filthy talk, worldliness. Bookmark the permalink.